Sherbrooke, June 3, 2015 – In 1968 a group of community-minded women started a chapter of the Canadian Federation of University Women in Sherbrooke, their goal being advocacy for the advancement of education. It became a weekly tradition for members to drop their change and dollar bills into a collection basket, to be used to assist young people pursuing education. Over the last forty-seven years, these efforts have formalized into the Lampe Foundation, which in 2014-2015 gave out a record breaking 29 awards at the post-secondary level and 7 awards at the secondary level. These awards are valued at over $30 000. 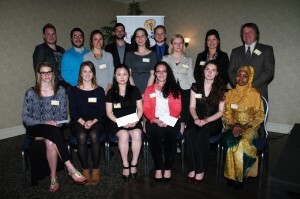 The Foundation’s annual awards gala was held on May 21st, at Hotel Le Président in Shebrrooke. Emceed by Foundation co-president Heather Bowman, awards were presented by representatives from Bishop’s, Lennoxville Vocational Training Centre, the Tillotson Coaticook Regional Fund, Champlain Regional College and the Faculté de Médecine et des Sciences de la Santé de l’Universite de Sherbrooke. 15 award winners were present during the gala event, each with their own story about why they’ve chosen their path, what they plan to accomplish, and how they have managed the sometimes arduous journey. Winners Vicky Veilleux, Nataliya Veremko and Michèle Dupont-Giard are working mothers returning to school in a range of university fields (psychology, law and physiotherapy), and Samuel Dupont Desbiens is pursuing the Champlain nursing program while expecting his first child. Lisa Astrologo spent her year at Bishop’s studying research psychology while also finding the time to raise $15,000 for local charities. Champlain science student Di Sun volunteers her time as a French and math tutor to her fellow students and is off to McGill in the fall. We can all be proud of the three common threads of gratitude expressed by the winners, who were thankful for: 1) the financial support that relieves some of the burden of school fees, 2) the privilege of pursuing a career in a field they are passionate about, and 3) the encouragement from a community that they aim to give back to one day. The evening was also marked by the presentation of a $2 000 cheque to the Lampe Foundation by Marie Trousdell on behalf of the CFUW, Sherbrooke and District. This generous donation supports the endowment of a scholarship named in honour of Eileen Healy, a past CFUW president who passed away this year. 2015 recipient Lisa Astrologo pays fitting tribute to her memory. The Lampe Foundation is pleased to provide the financial assistance to the shining stars of the Eastern Townships, allowing them to focus on their studies and community involvement as they continue to light the way to a brighter future. Thank you to all of the individual community members who have supported this cause. You are making student’s dreams come true. 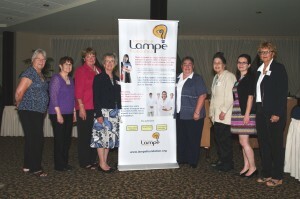 For more information on scholarships or to donate to the Foundation visit www.lampefoundation.org. 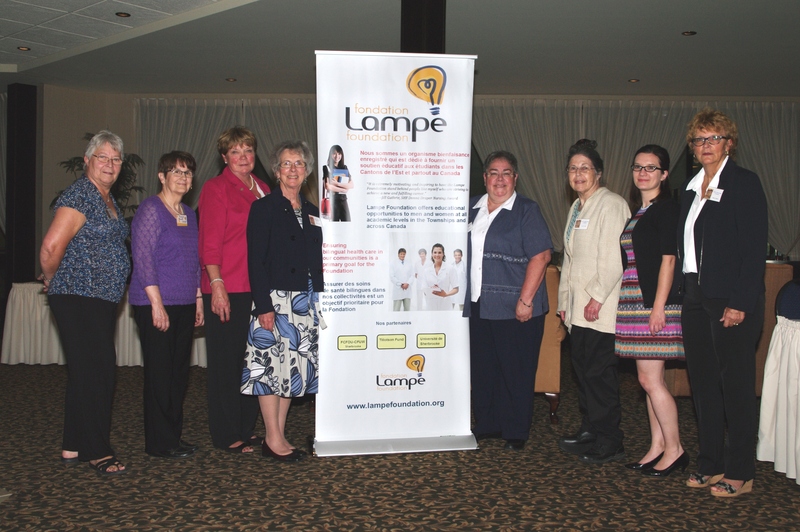 The Lampe Foundation, CFUW Sherbrooke & District is a non-profit organization dedicated to providing education support for students from the Eastern Townships and across Canada. It is proud to offer scholarships in partnership with numerous educational institutions and private foundations. Group photo: Award winner present at the annual awards gala on May 21.